The large hall of the Mechanics Institute was crowded again on Thursday: evening, when Mr. and Mrs. George Case gave another of their pleasing entertainments, entitled “Odds and Ends.” At the rising of the curtain Mr. Case, with a sorrowful expression of countenance, is bewailing his indisposition, which is attended with an entire loss of appetite; his better half declares it is all fancy, reminding him that for breakfast he ate three mutton chops, as many, eggs, and sundry, slices, of toast, whilst she had found fit necessary to send all his waistcoats to the tailors to be enlarged, as the buttons were bursting off. Mr. C only wants to be roused up, and a happy thought strikes her for accomplishing that object: Mrs. Case has a number of costumes prepared for the entertainment; with these she will array herself and so work up the fancied invalid, into a state of excitement. With this little explanation Mrs. Case proceeded to impersonate the various characters selected for the evening which she accomplished with marvellous celerity. Her nervous lady afflicted with “the rheumatiz” was life-like, whilst the jokes and pokes of the barber Brush were supremely ludicrous. “Sairey Gamp,” the model of a sober nurse, was admirably rendered. As the Wizard of the East Mrs. Case is very clever, and the Protean Cabinet tricks baffle hundreds of natural philosophers, notwithstanding the simple explanation of the secret given by Mr. Case. Nature, he said, abhorred a vacuum, and after a person was placed in the cabinet the air was exhausted by means of a pump, when, presto the individual vanished up the flexible gas tube and when the air was forced into the cabinet he came down again! in 1860, in the parish church of the “parish of Halifax in the County of York”. (There is a Elizabeth Grace Croft, daughter of William Patrick & Ann Croft who was baptised in London in 1835). Grace Egerton at the new Polytechnic Hall (copy of an engraving of the couple on stage). Treasure Trove: the many different characters of Grace Egerton (by the National Portrait Gallery, on ABC). For an actor the work that goes into developing a character is a huge task, imagine playing fifteen different roles in a night. That was the skill of Grace Egerton, a variety performer who toured Australia in the 1860s and 1970s. She first appeared in Melbourne in September 1864 with her husband George Case. Among the recent arrivals in the colony are Mr and Mrs George Case — the latter better known as Miss Grace Egerton — whose drawing-room entertainment, to judge by the newspaper criticism, has long been popular both in London and the provinces, Mrs Case is widely known as a singer and character actress; and Mr Case as a performer on the violin and concertina. The Polytechnic-hall, which has been closed for some months past, was reopened yesterday evening, having, in the interim, been rebuilt and transformed into a neatly-decorated, lofty, and well-lighted assembly-room, capable of seating some 800 people. The evening’s entertainment was one of those light, sparkling pieces of character-illustration Miss Emma Stanley first made popular in this city. In this instance, tho oddities by whom the visitors were edified and amused were personated by Miss Grace Egerton (Mrs. George Case), assisted by Mr. George Case. Both the performers are not unknown to fame in the mother country; but both on this occasion made their first appearance before an Australian public. 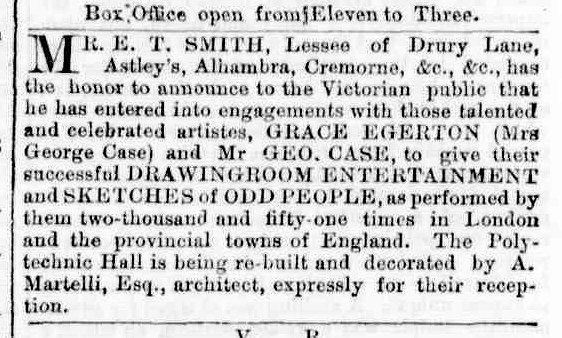 MR. AND MRS. CASE’S ENTERTAINMENTS. Mr. and Mrs. Case (Miss Grace Egerton) made their first appearance in Southland, on Monday evening, Feb. 12, at the Theatre Royal. The house was crowded with a select and appreciative audience. The entertainment was entitled The Drawing Room Floor.” It was a complete success. Mrs. Case is an accomplished and graceful actress; has a wonderful power of imitation, playing every part with a vivacity and truthfulness, we have scarcely ever witnessed. The whole of the performance is entertaining and refined the changes are rapid and complete. Mrs. Case took no less than nineteen characters, and it would be difficult to say which was best, when all were good. Her Lady Teazle was excellent, as was also Katty Mooney, a maid-of-all-work from the Emerald Isle but it would be folly to particularize. In every part she was perfectly at home, except perhaps, that of the “Wizard of the East.” Although in this character great dexterity and ability is displayed, it is a misconception the tricks are wonderfully well performed, but a Turk talking beautiful English is scarcely consistent, Mrs. Case might with a fair show of right put in an appearance as a rival of the Wizard of Wizards (Jacobs) or the great Wizard of the North (Anderson), either of whom we feel certain she could mimic to life. The versatility of talent, the refined judgment, and thorough earnestness displayed by Mrs. Case in her delineations of all countries and all people, the refined Lady Teazle or the dacent Katty Mooney, the English fop or the country bumpkin, the old or the young, the educated or the ignorant, appear all alike to her, she is throughout inimitable. HOME AMUSEMENTS-The London Stereoscopic Company is continually introducing some new trick or scientific toy to the notice of the public, many of which are exceedingly ingenious and beautiful. Messrs. Walch Bros. and Birchall announce that they have just received a shipment of the latest novelties in this way, including miniature Protean Cabinets, by means of which Grace Egerton’s marvels are clearly explained. The “Italian Problem” is a new trick that will afford amusement for the winter evenings. That popular artiste, Grace Egerton, who delighted the people of New Zealand some nine years ago, and who has since travelled round the world, will again make her appearance at the Prince of Wales Theatre to-morrow night, and amuse and interest the audience with her great entertainment, Abroad and at Home.” It would be well if readers would peruse the little book of thirty-two pages, entitled A few words from Grace Egerton to her many patrons, friends, and the public,” which forms a kind of mirror of opinions on her representations, expressed by persons in every civilised part of this old and beautiful world, with a brief, pithy introduction by the lady herself. This talented lady, in a variety of characters and ballads has had the privilege of amusing the people of Japan, and sending the ludicrous Chinaman into fits of laughter. The Japan Herald tells us of her success, in Yokohama, and, according to the North China patty News, Grace Egerton entirely enlisted the good wishes of the inhabitants of Shanghai. This artiste, accompanied and assisted by her husband, met with a series of triumphs in her merry pilgrimage through South Australia, California, the United States, British America, India, West India Islands, and in other parts of the civilised world. At one place, she was showered with bouquets of sweet smelling flowers, and at one place in Canada, a young poet bursts forth into song as if by inspiration on witnessing the rapid changes of character presented in one person. Apart from her character representations, Grace Egerton. sings remarkably well, and is equally good in sentimental and comic song, but one of her most telling feats is her clever imitation of Sims Eeeves, the great English tenor, and her rendering in Reeves-like manner, the ever popular song, The Death of Nelson. We need only add at present that Grace Egerton and Mr. George Case will give their first entertainment to-morrow (Thursday) evening, at the Prince of Wales Theatre, and that the curtain will be lifted precisely at eight o’clock. Many readers will regret to see among the announcements of deaths that of Mrs. George Case (Miss Grace Egerton). This accomplished lady and her husband were well known and well liked by Brisbane playgoers who remember the pleasant entertainments they used to give. Mr. and Mrs. Case had just completed a trip across the American continent, and were on their way to Queensland at the time of the lady’s death. They had been so pleased with Brisbane that they were determined to settle down here, having secured a pleasant site for their future home at Breakfast Creek. 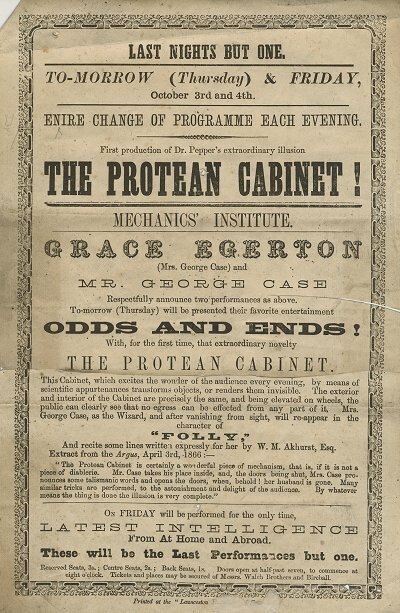 …the problem of effecting disappearances or escapes received a far more scientific solution at the hands of Messrs. Pepper and Tobin, who produced the Protean cabinet at the Polytechnic Institute, London, about 1868. This cabinet is generally exhibited on a stage, where it Is subjected to close scrutiny by a committee of spectators, and is so arranged that the front, back, sides, top and bottom are all visible to the audience or committee during the entire progress of the illusion, yet this does not interfere with many inexplicable appearances, disappearances and substitutions. (It must have been developed prior to 1868, if it was being shown in Launceston in 1867.) 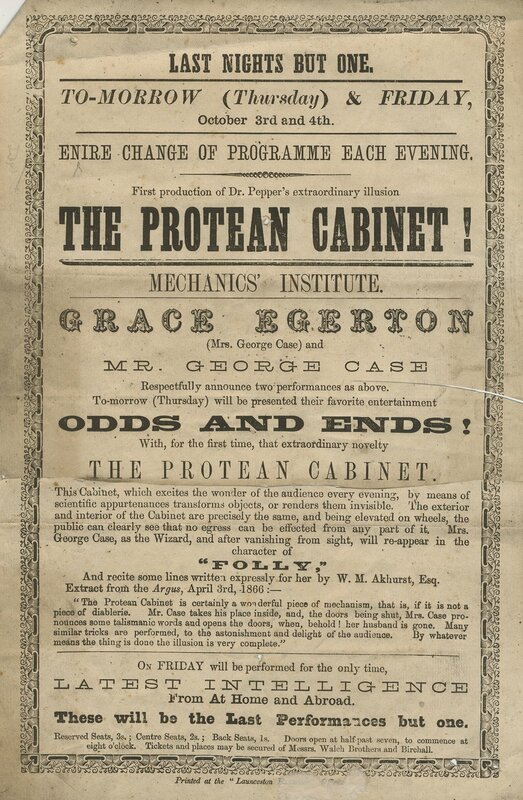 I had a look for contemporary advertisements for the cabinet, rather than performances, but found only one of any length (a companion to the lines promoting the London Stereoscopic Company above). Professor Pepper died and in 1900, and there appeared in probably every regional newspaper a long article discussing the various illusions he developed (although little more than a mention for the Protean Cabinet). In the death of Professor Pepper, at his residence in Colworth-road, Leytonstone, there passes away a personage who may be rightly looked upon as the originator of the modern style of illusion. He was the creator, some thirty- years ago, of the celebrated “Pepper’s Ghost,” and for some time earned much fame and no little fortune by the exhibition of an illusion which was then looked upon as marvellous, but the secret of which is easily explained. This was in the days when those curious variety shows of recreative science known as polytechnic institutions were popular with a class having midday leisure and no settled way of passing it. Now, if you’re wondering how this particular disappearing cabinet work, the internet offers explanations including a small scale protean cabinet with bananas and another explanation that appears to have come from a book. Both contain SPOILERS, obviously.